When people say a car looks like a $1,000,000, it is usually a figure of speech ... unless they are talking about an F1 car! They would not normally be referring to a roadster, at any rate. Not unless it was the McLaren F1 road car, that is! The first off the production line of the most exclusive roadster ever built, had its last nut nipped up on Christmas Eve of 1993. There were another 99 of them to come. If you wanted one, you would need $1,070,000 ... or £635,000. If the F1 was not enough, though, there was always the F1 LM 'limited-edition' version to fall back on - resplendent in the orange colours of racing driver Bruce McLaren. He was founder of the race-car constructor which bore his name. The McLaren brand bent over backwards to give the buyer as many customisation options as possible. Some things, however, are best left to professionals - like the engine, for example! BMW Motorsport were recruited to design the F1's V-12 powerplant. They did a good job. The F1 produced 627bhp, giving it a top speed of 231mph! Over the speed limit, certainly. But, you could still do the shopping in it - if you went easy on the throttle! The motor was finished off in gold - not just the colour, but the metal itself - the better to shed heat. If you did have engine trouble - or, indeed, any other issue - McLaren would fly a mechanic out to you. Any time, any place ... all part of the service! When a car has taken 6,000 man-hours to build, the little things matter. The F1 was the brainchild of Gordon Murray. Head of Formula One design at Brabham - and then at McLaren - he was well-placed to oversee the car's technical needs. The task of styling the most exotic car ever built fell to Lotus man, Peter Stevens. Murray's planning stage focused on a few key issues. It was important to him that the F1's three seats formed an 'arrowhead' - with the driver centrally-located at its tip. Another core concern was that the F1's weight was pared down to the absolute minimum. Every part played a rôle in lightening the load - down to a staggering 2,205lb. In August 1993, after so much precision engineering had been lavished on the car, it was at last ready for testing. Ex-F1 pilot Jonathan Palmer stepped briskly up to the plate - at Italy's Nardo test track. The performance figures he wrung out of the McLaren were off the dial. Only Gordon Murray could have even dreamed of them. Bring on the racetracks! The F1 GTR won virtually every race it contested - including the Le Mans 24 hours, 1995. In the final analysis, the F1 was almost beyond automotive - taking the motor-car across frontiers never previously approached. 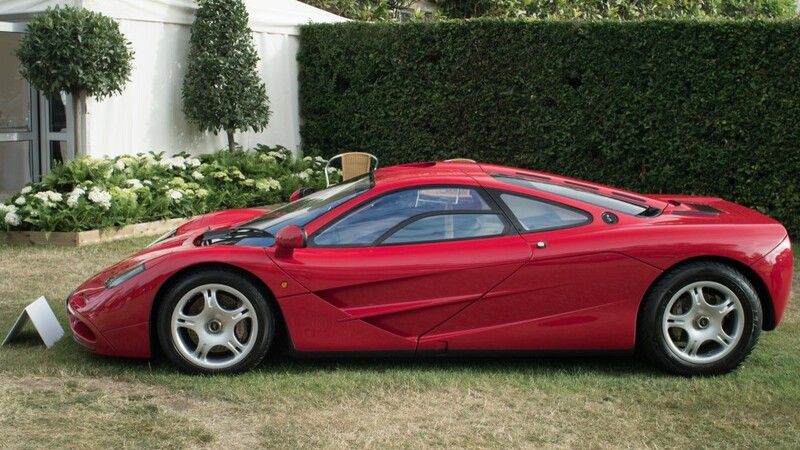 The McLaren F1 looked like $1,000,000 - because that it is what it cost. Engine by BMW Motorsport, styling by Peter Stevens, ... genius by Gordon Murray!